The days kind of schloop by like a bucket of very slow, cold syrup. They're spent repeating a curriculum almost so blatantly uninteresting that my computer and I go sleep every fifteen minutes. ACTUALLY I can tell you all about sockets and socket programming on the Application layer of the TCP/IP model. A socket is a host-local, application created, OS-controlled interface-- hold on, where are you going?! Aww. Guess I just have to suffer this by myself. 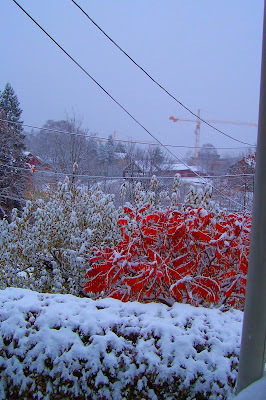 This photo I took from our livingroom window after first snow last year. In fact I DID adjust the saturation, but the tree has red leaves originally. "I can tell you all about sockets and socket programming on the Application layer of the TCP/IP model. A socket is a host-local, application created, OS-controlled interface"
Come on baby, tell me all about the OSI 7 layer model. Oh yeah, that's it. Application, presentation, session... oh yeah... Transport, network.. Nearly there... Data link.. Think I'm gonna..... PHYSICAL LAYER!!! Could you please pass me a towel? I wish I saw it this way. Or, considering I have to sit and write about it for three hours surrounded by old people and my classmates - perhaps not.